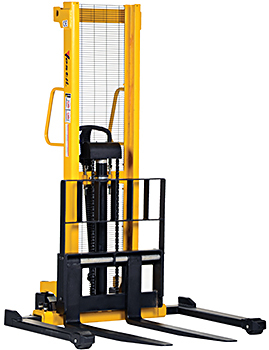 The Vestil VHPS-2000-AA Manual Hydraulic Pallet Stacker is designed to be compact enough to fit through standard sized doors, simple to operate, and maintenance free. This versatile manual pallet stacker can lift 2,000 LBS to a maximum height of 63”. 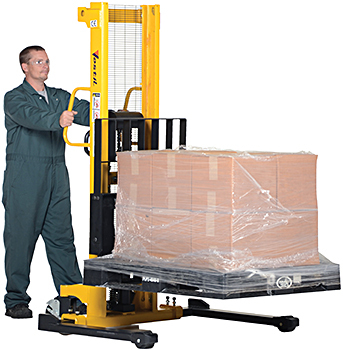 Stacker features adjustable forks and adjustable legs allowing it to be used for lifting regular pallets and open bottom skids. Forks adjust from 7⅞"W O.D. to 26¾"W O.D. and legs adjust from 46"W O.D. to 57⅞"W O.D. Forks are 42-1/8” long and are raised via hydraulic hand pump operation and lowered using a release lever located on the handle. 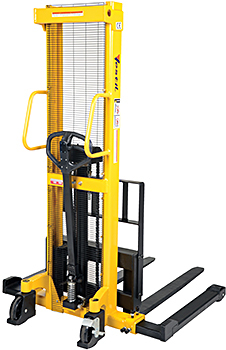 Manual pallet stacker lifts forks 1" per handle pump. The Vestil VHPS-2000-AA rolls easily on two rigid and two swivel casters with brake. Forks adjust from 7⅞"W O.D. to 26¾"W O.D. Legs adjust from 46"W O.D. to 57⅞"W O.D.